ADELIH (Association des Doctorants et des Jeunes chercheurs de L’Institut d’Hématologie) is a French association founded in the early 2000’s by three PhD students. Its aim is to federate all students and young researchers among their research institute IUH (Institut Universitaire d’Hématologie) through the organisation of events. ADELIH congress is organised since 2014 to create the opportunity for national and international interactions around the field of cell biology and translational research. Knowing the success of the 1st edition talking on the theme of Tumor Microenvironment, the ADELIH’s young researchers organized the 2nd edition on the 13th- 14th October 2016, focused on the theme of Post Translational Modifications: From Bench to Bedside. The meeting counted with several speakers from PROTEOSTASIS network such as Rosa Barrio (Chair), Alfred Vertegaal (MC Member), Manuel S. Rodriguez (Core Group Member) and Frauke Melchior (Working Group Member). 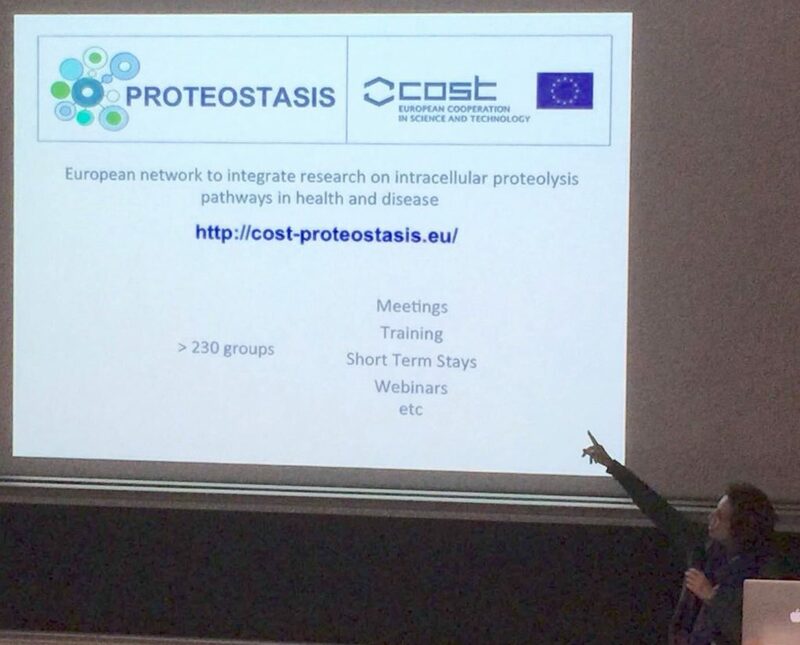 Dr. Barrio introduced PROTEOSTASIS to the audience and explained the activities carried out by the network. Particularly, she presented the 3rd PROTEOSTASIS Workshop “PROTEOSTASIS and its biological implications” that will take place in Lisbon from the 2nd to the 5th of November (http://cedoc.unl.pt/proteostasis2016/).